Back in the 1980's, the buddy cop comedy was a foreign concept. Up to that point, most of the movies have revolved around a teenager who got to witness his parents adolescent, a child who discovered an alien in his backyard and a man that has a close encounter. But when Lethal Weapon came along, the genre changed. Now having two adults placed in high octane situations while they spit out witty one liners became the name of the game. It was the chemistry between Mel Gibson and Danny Glover that helped launch the Lethal Weapon series. There are few alive today who haven't seen that film. But just for those of who haven't, here is a small synopsis. Danny Glover is Sergeant Murtaugh, a LAPD detective who isn't the spry recruit he once was. Enter Martin Riggs (Mel Gibson), an unhinged detective who is placed as a partner to Glover. Their relationship is strained at best, but as the movie progresses they grow to tolerate one another which develops into a mutual respect. The first movie was so successful that 3 sequels were spawned. Each one developing as well as expanding on the core characters. With such a large fan base and successful history, it isn't surprising that these films were collected into a box set which is now available for purchase. Audio Commentary: The ever-cantankerous, ever-candid Richard Donner never quite finds his groove and sometimes treats his Lethal Weapon commentary as if it were a chore. Granted, the director never pulls any punches, which can be great fun, but he also doesn't offer a whole lot of insight into the production, firing off thoughts as they come to him without digging into the film, its performances, its development or the series' legacy. Patient fans will eventually piece together a sense of Donner's approach to buddy cop film making, but they'll have to endure long stretches of silence, rapid fire quips, and short answers to bigger questions to do so. Deleted Scenes (HD, 30 minutes): Fourteen deleted scenes are included: "Breakfast," "Morning Ritual," "At the Range," "In the Line of Fire," "Questioning Dixie," "Home," "Wanna Jump?," "Swimming Pool Shootout," "Home for Dinner," "Kiss Goodnight," "Watch Television with Me," "Caught," "Kidnapping" and "Busted." Music Video (SD, 3 minutes): "Lethal Weapon" by Honeymoon Suite. Audio Commentary: Donner returns to the mic, gruffer and grumpier than ever. Long pauses, left field comments, at-times dismissive answers (to the few questions he's asked), and a lack of focus make listening to this track an exercise in patience that never quite pays off. I'm a big Donner fan, don't get me wrong, but without an ax to grind or a grand story to tell (a la Superman II), he just doesn't have much to say. Deleted Scenes (SD, 4 minutes): Only three deleted scenes are available this time around: "Trish's Car," "By the Numbers" and "What's the Water Like?" Unfortunately, this batch is presented in lowly standard definition. Stunts & Action (SD, 4 minutes): A vintage featurette, hardly worth watching. Audio Commentary: Three commentaries in, Donner finally starts to warm up to the process... not that it helps much. More time is spent talking about the various threads that run through the films, giving Donner more to talk about at any given moment, but the director still frequently drifts off, loses himself in the movie, and forgets to chime in about what's happening on screen. If you've made it this far, though, you'll find yourself getting something out of Donner's running franchise commentary, even if everything he has to say of value could be condensed down into a single, two-hour track. Deleted Scenes (SD, 4 minutes): Three more hit-or-miss deleted and extended scenes for your viewing pleasure: "Doggie Heaven," "Interrogation" and "Did You Forget Something?" Music Video (SD, 5 minutes): "It's Probably Me" with Sting and Eric Clapton. Audio Commentary: Ironically, the least of the Lethal Weapon films features the greatest of the Lethal Weapon commentaries. Donner, producer J. Mills Goodloe and associate producer Geoff Johns deliver a non-stop, rat-a-tat-tat overview of the production and final cut of the film, touching on anything and everything fans might want to know. Donner is incredibly focused -- finally -- and, more often than not, even dominates the conversation. Had the first three Lethal Weapon commentaries been this good, there'd be very little to complain about in regards to the 5-disc set's supplemental package. Pure Lethal! New Angles, New Scenes and Explosive Outtakes (SD, 31 minutes): A hodgepodge of content from all four films, crammed into a nutty crowd-pleaser doc hosted by series star Danny Glover. Psycho Pension: The Genesis of Lethal Weapon (HD, 24 minutes): Donner, Mel Gibson, Danny Glover, writer Shane Black and a host of supporting actors, producers and current and former film executives who've had a hand in the franchise paint a fascinating picture of the early '80s studio culture, the script and characters, the film makers and talent, and the then-unique blend of explosive comedy and equally explosive action that gave birth to Lethal Weapon. A Family Affair: Bringing Lethal Weapon to Life (HD, 30 minutes): Creating the look, world, characters and feel of the Lethal Weapon series. Donner, Gibson, Glover, Black and other familiar faces reminisce, talking about the on-set relationships, atmosphere and collaborations that transformed Black and Donner's risky action picture into a multi-million-dollar franchise. Pulling the Trigger: Expanding the World of Lethal Weapon (HD, 30 minutes): Home video success stoked the flame for the Lethal Weapon sequels, but it took more than a hungry audience, an audacious director and a willing cast to make it happen. It required an ever-expanding story, new characters, new actors, and new obstacles for Riggs and Murtaugh to overcome, bigger action and set pieces, higher and higher stakes, and something more than "more of the same" to complement the original. Maximum Impact: The Legacy of Lethal Weapon (HD, 22 minutes): "These movies defined a time and a place." Lethal Weapon 4 is front and center as Disc Five's fourth documentary begins, but it isn't long before producer Joel Silver, Donner, Gibson, Glover, Rene Russo and other members of all four films' production teams examine the franchise, look at the various social issues each film tackled, attempt to measure the series' cultural impact and, of course, touch on its legacy, for the actors, the film makers and audiences the world over. The Lethal Weapon series speaks for itself. Its first two films are action classics, its third is a solid companion, and its fourth is the only entry that falls short of greatness. But how does Warner's new Blu-ray release stack up? Wonderfully. Do yourself a favor, buy this set, now. 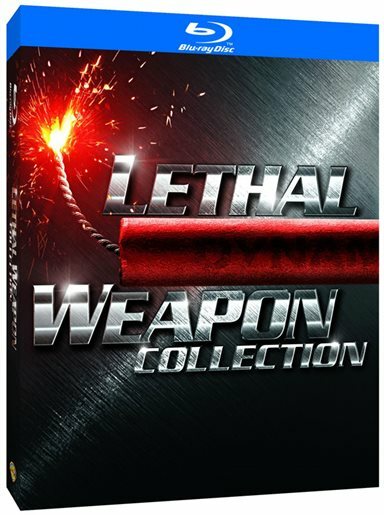 Download Lethal Weapon Collection from the iTunes Store in Digial HD. For more information about Lethal Weapon visit the FlickDirect Movie Database.